More precisely, it begins at the confluence of a North Fork and a South Fork in modern-day Taliaferro County, Georgia. From there the Ogeechee’s free-flowing black waters travel toward the Atlantic coast south of Savannah, where they ramify into salt marshes and are subsumed in the tidewater. “That’s the way I’d tell people,” says Cliff Thomas, Jr. “That’s my river. And I take pride in saying it, but anybody you meet on the river is going to tell you exactly that.” This is true in a figurative sense, and it is also true by law. There’s no commercial easement on the Ogeechee. No hydroelectric dams. No levees. No impediments to the river’s will and no barriers to travel, save snags and stumps and the occasional sandbar—or, alternately, the unladen piers of disused railway trestles, or the wrack of somebody’s fishing camp, their deer stand, or some other once-hopeful, man-made structure, since swept aside by flood or the river’s constancy. As for the public—you and me and other recreators of various kind and skill—we can access the Ogeechee at any number of river crossings, beaches and boat ramps and paved landings, which may be managed and monitored, derelict, or given to nature, but are never quite forlorn. Among the busiest of these pull-outs is Morgan’s Bridge at Highway 204, which was formerly Morgan’s Ferry and before that Monroe’s Ferry, the riverbank there part of lands granted by the King of England to the forebears of Monroe “Brunson” Schuman. Today, the river is beset. In 2011 there was a fish kill at Dover below King America Finishing, Inc. (and just above Brunson’s home). King America produces flame-resistant fabrics and the plant, albeit subject to stringent testing, continues to discharge treated effluent into the river. According to the Georgia Department of Natural Resources, there are no fewer than 98 such active permits, industrial and municipal, belonging to wastewater treatment plants and other, similar facilities along the 254-plus miles of the Ogeechee’s run. These days, Larry is a habitué of Steel Bridge—a river landing just a little bit upriver from where he would go as a kid. He spends his afternoons there in the shade, among a circle of friends and passersby, and whosoever’s off the river. It doesn’t matter to him. “It’s one thing about the river,” he says. "It's a natural bond. Man needs help—go help him. Man needs anything—he don't have to ask. 2* Larry Lucas served as a scout (Long Range Reconnaissance Patrol) during the Vietnam War. As he tells it, “If we knew we was going on a mission, we wouldn’t shower, wouldn’t bathe for two or three days, and all we would eat is what they eat. Never use underarm or aftershave lotion, or shaving cream. None of that stuff. We’d eat dried minnows and rice, just like they did. The kimchi. Lot of garlic in it. Shoot, I used to love that. I love kimchi.” To this day, you can see the scar at his neck where once “they” tried to cut off his head, and his head has a slight, quizzical wobble to it when he’s talking to you. Where the law leaves off, life on a privately-owned river that is at once publicly-accessible relies on common courtesy and commonplace etiquettes. Rosemary Stokes and her family have been living on the river since before she was a little girl. 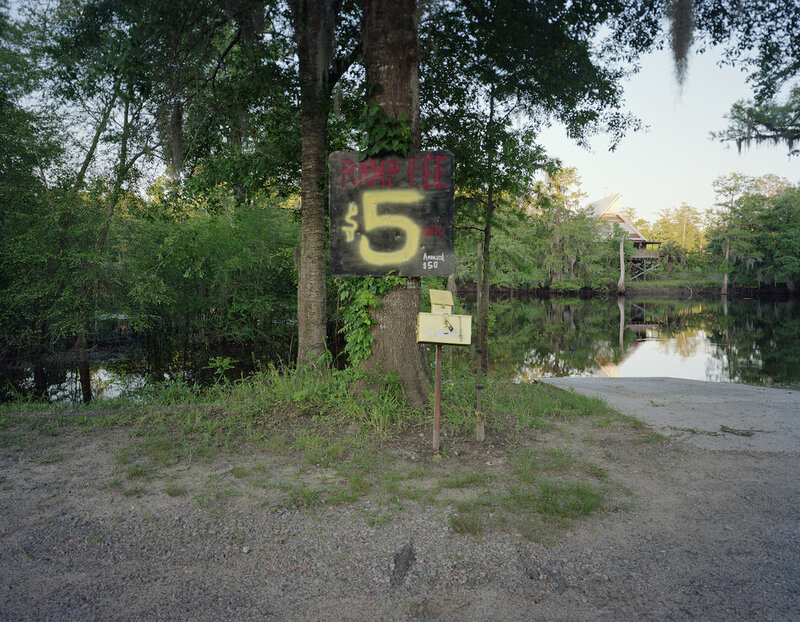 The Ogeechee is a place where cousins grow up like brothers and sisters, because everybody always comes back to the same place, and she remembers days when she would sit with her cousins all in a circle on the bottom of the river, hosting underwater tea parties. The water was that clear. “Well,” Nell confesses, “I have felt like doing that once or twice. 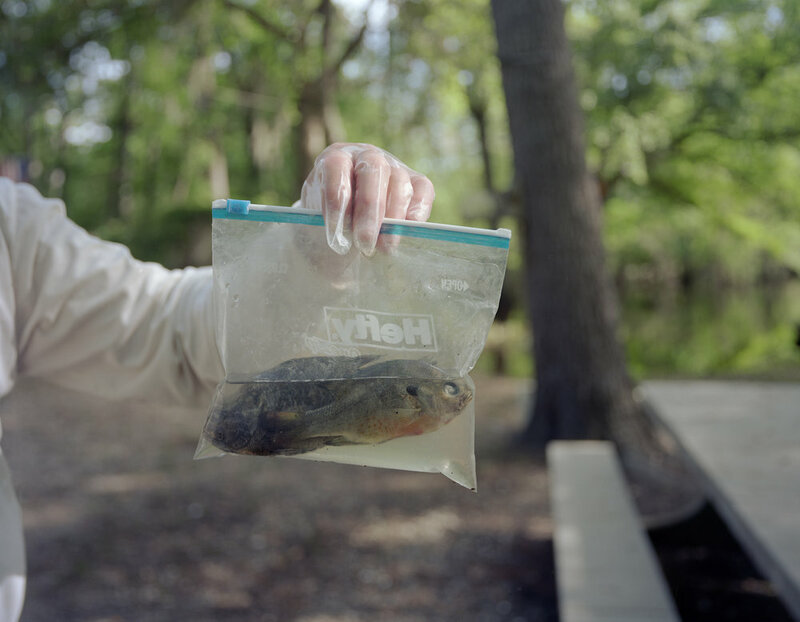 Used to be years ago, I’d be sitting on the porch, and there’d be plenty of places to fish everywhere, and they’d come fish right in front of my porch.” So on the Ogeechee there’s the law qua law, and then there’s the court of public opinion. Rosemary and her sister, Doris, talk of worms and crickets, of the different smell of a river cabin (that could just be the smell of childhood), and of the smell of the river itself back when. “You know when you’re near it,” Rosemary says. “It’s like smelling fresh rain,” Doris suggests, and pretty soon they are talking about the rope swing at Cason’s Landing…or how if you were looking for somebody in the county on a weekend in the summer, you could be sure they’d show up at Steel Bridge sooner or later… and about Dasher’s Landing, where you hardly ever had any trouble, but every once in a while there’d be a live band and that’s when things would get rowdy. But at some point, no matter who you speak with, talk will pass to how the Ogeechee has changed and how it’s deteriorated. “I don’t respect the fact that they are blatantly violating the law with no punishment," Cliff Thomas says. "And these politicians in Atlanta, somebody should beat their behinds for permitting it." He is a beekeeper now, and his tupelo honey is much sought after, being the product of a species of tupelo, Ogeechee nessa, which is particular to the region and the river. A river is a hard thing to share. 3* Dinkie Minor tells a story about when J.M. Sikes got audited by the IRS. “J.M. gathered up everything he could find—every grocery receipt—and put it in a greasy brown paper bag. He put crab bait in his jacket pockets before he went to meet with the lady downtown. (He said he knew he had her when he walked in the office and she got out a handkerchief, poured perfume on it, and held it to her nose.) Turns out that if you’re illiterate, if you can’t read or write, by law they have to help you with your taxes. So J.M. dumped that bag of receipts on the table and told the lady he was illiterate and that he needed her help. He said, ‘Ma’am, now, I want to cooperate, but the next time we meet I want you to come down to my office on the river where I’m crabbing.’ She agreed to do it, and J.M. has never heard from the IRS since."